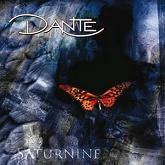 Review: "Dante: Saturnine" - Sea of Tranquility - The Web Destination for Progressive Music! Those who follow the international indie prog scene might remember 2007's The Inner Circle, the debut from German progressive metal band Dante. Well, the band are back with their follow-up, titled Saturnine, and they now find themselves on ProgRock Records, which is a great place to be for this young band. Formed back in 2006 after meeting at a Dream Theater concert, the members of Dante have taken the influence of that band and added in some symphonic & romantic flavors to come up with a sound that is quite pleasing on the ears, yet challenging enough for genre fans. Saturnine picks up soundwise right from where The Inner Circle left off. To be honest, Dante's style is more moody, melodic prog than progressive metal, but they do feature plenty of heavy riffs and barnstorming guitar & keyboard exchanges which is a prerequisite of the genre. The epic opener is full of riffs and solos, but it's the gorgeous keyboard tapestries of Markus Maichel that creates the haunting atmosphere which allows vocalist Alexander Gohs to soar over. The two pair off quite nicely on the dreamy piano led ballad "Drifting", as well as the brooding "Maybe One Day", showing a tender side to the band. If you like the bombast, well, there's plenty of that here, starting with the crushing "Last", a seeting prog-metal beast saturated with bubbling keyboards and crunchy riffs & solos from guitarist Markus Berger. Bassist Michael Neumeier gets in on the action alongside his rhythmic cohort, drummer Christian Eichlinger, on the intricate "Never Return", an adventurous number that mixes symphonic prog, metal, and jazz-fusion into a burning cauldron and spews out a completely new entity. Look for some white-hot solo exchanges later in the song, especially from Berger's guitar and Maichel's blistering organ. The wild instrumental "Modal Acousma" lets the guys strut their stuff within a prog/metal/fusion framework (love Maichel's organ tone on this one! ), and the CD closer "Vanessa" is the big epic, all 19 minutes of it. Quite symphonic let containing plenty of metallic passages, "Vanessa" features some haunting melodies to go along with its compelling instrumental & vocal sections. Look for solos left and right, and some heart wrenching vocals from Gohs, who truly is one talented singer folks. If you like 70's styled keyboard sounds, there's plenty of that here as well on this adventurous tune. Good to see a band this talented at home on a label that will certainly give them every opportunity to succeed. My first thought when hearing their debut a few years back was that SOMEONE needs to hear this band and sign them up-thankfully Shawn Gordon & ProgRock Records stepped up to the plate. Saturnine is the next step after the promise of The Inner Circle, and signals the arrival of a major player on the prog/prog-metal scene.